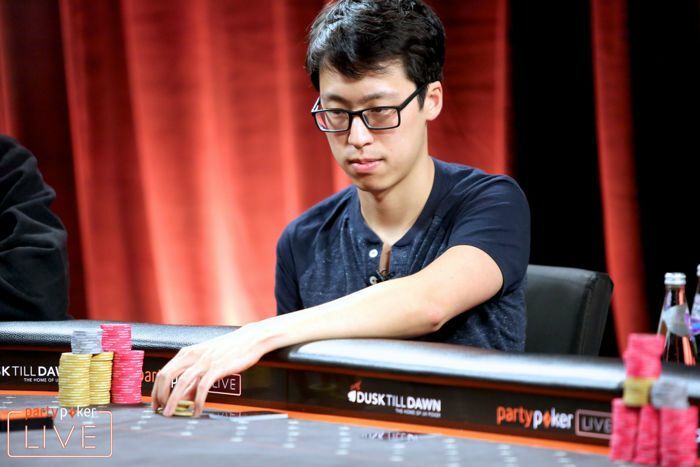 After five intense days, the partypoker LIVE MILLIONS UK Main Event Champion has been crowned. 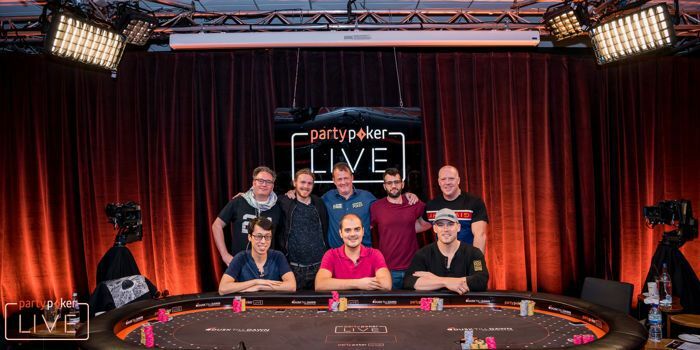 After five intense days, the partypoker LIVE MILLIONS UK Main Event Champion has been crowned. 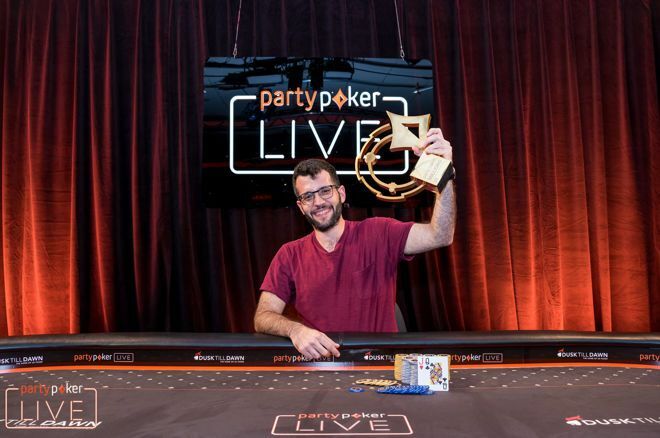 Ioannis Angelou-Konstas conquered 1,014 other hopefuls after defeating Alex Foxen heads-up for a whopping £940,000 and the partypoker trophy. "I am in shock, I literally am in shock I think." The stacked final table featured many poker superstars who wouldn't be out of place in any of the big tournaments all over the world. Antoine Labat, Tom Hall, Sam Grafton, Michael Wang, John Haigh, Dara O’Kearney, and Ryan Riess all took a seat at the feature table at the start of the day. The day started with nine players returning to the unofficial final table. Only ten minutes after the restart, Wang picked up eights and raise-shoved after Foxen found aces and had three-bet. Foxen snap-called to earn the first double-up of the day. Forty-five minutes into the day, Riess shoved his king-jack into the ace-ten of Haigh and got no help from the board. The 2013 Main Event Champion was sent home as the Final Table bubble in ninth place for £50,000. The most prominent fold of the day went to Foxen when he first called the shove of Hall with queens but folded to the overshove of Angelou-Konstas. Both Hall and Angelou-Konstas held ace-king and split the pot in the end which Foxen would have won if he had called. Less than ten minutes later, it would be O‘Kearney’s turn to say goodbye. O’Kearney picked up a pay jump after having come into the day as the short stack and shoved his last four big blinds holding eight-seven suited. In the three-way pot, Haigh scooped it all by flopping two pair. It would then take almost another three and a half hours of chips going back and forth between the players before Haigh was eliminated. In another ace-kings against queens situation, Haigh drew the short straw with the queens when both Foxen and Hall flopped a king. His last chips were split between them, and Haigh picked up a career-high cash of £100,000. Two hours and twenty minutes later, Wang was taken out. Wang had defended his big blind with ten-seven off after Angelou-Konstas had raised the cutoff with pocket aces. The flop came five-eight-trey, and Wang check-called a bet. The turn was an ace to give Angelou-Konstas a set, and Wang check-called again. The river gave Wang a pair of tens and Wang check-called for the last time when he was put all-in. Wang cashed for £140,000 for finishing in 6th place. Grafton’s elimination happened a mere fifteen minutes later when he called with jack-ten after Angelou-Konstas had put him all-in. Angelou-Konstas flopped two pair with seven-six and improved to a full house on the turn. Grafton jumped into the Main Event on Day 2 and made a deep run, finishing in 5th place for £205,580. Hall left the stage in fourth place after having doubled up Labat first and then running his last six big blinds into the ace-king of Angelou-Konstas while holding king-queen himself. Hall flopped a straight draw and hit it on the turn but Angelou-Konstas rivered a flush to halt Hall’s dreams of winning the Main Event in the casino where he once used to work as a dealer himself. He got a hug from his mum and then left to collect his payout for £300,000. Chips kept flying back and forth until Foxen doubled up when he found aces again. Angelou-Konstas had flopped a pair of queens and called Foxen’s shove on the turn. No danger on the river for Foxen and suddenly the chip lead was in Foxen’s hands. Twenty minutes later, Angelou-Konstas took it back, though, when he hit a two-outer on the turn with pocket sixes against the pocket eights of Foxen. Less than ten minutes later, Labat found his Waterloo when he shoved king-eight on the six-six-deuce flop and was insta-called by Angelou-Konstas with ten-nine suited with the flush draw. The turn gave Angelou-Konstas the flush to eliminate Labat in third place for £440,000. Heads-up Angelou-Konstas had a commanding chip lead with almost 90% of all the chips in play in his stack. A deal was discussed but not agreed upon. Ten minutes into heads-up play, Foxen doubled up with pocket sixes against the queen-nine of Angelou-Konstas. After the double-up, they both agreed to a deal, Foxen would take £720,000 and Angelou-Konstas was ensured of £840,000. "A lot of the guys on the table were tough opponents, I respect them all, but Alex was probably the toughest." £100,000 and the trophy would be going to the eventual winner. Twenty minutes later, the board read king-ace-four-trey-ten, and Angelou-Konstas held the nuts with queen-jack for the straight. Angelou-Konstas check-shoved on Foxen’s bet and Foxen tank-called reluctantly with pocket eights. And just like that, the tournament was over after almost ten hours of play on the final day. The next partypoker LIVE event will be the Caribbean Poker Party, and we’ll be on hand again to bring you all the action from the beautiful Baha Mar in The Bahama's! 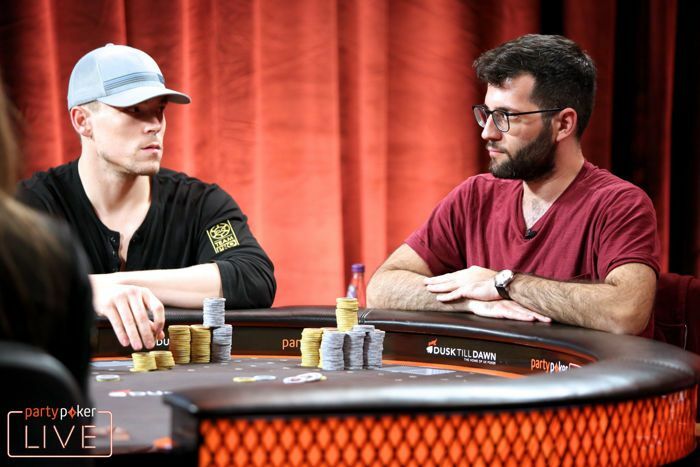 For a full recap of all the action of the partypoker LIVE MILLIONS UK Main Event, check the PokerNews live reporting section.